The Falcons fall in the state quarterfinals to the No. 2-ranked and defending champion Cavaliers. 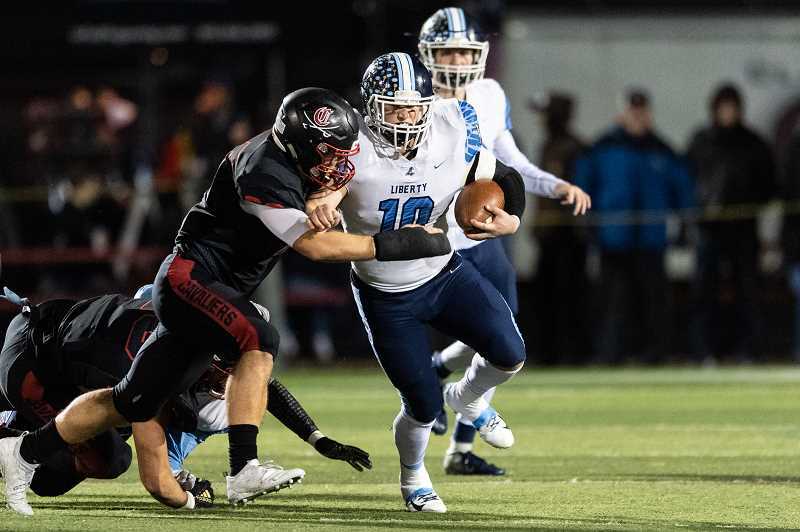 The Liberty Falcons football team fell in the state quarterfinals to Clackamas, 59-21, Nov. 16, at Clackamas High School. The Cavaliers jumped on the Falcons early, withstood a second quarter Liberty comeback, then pulled quickly away in the third quarter, ultimately en route to an easy win. But despite the defeat, along with the disappointment that came with it, there was nothing but pride — and a few tears — in the eyes and hearts of the Falcons players and coaches in the wake of the program's most successful season to date. "I'm just really proud of this group," said Liberty running back Aiden Maloney. "We made a commitment to each other and this team, and came out this season and had a great year. We set a new bar for Liberty football, and that's something I think we can be proud of." This year's Falcons team finished 9-3 overall, won a Pacific Conference championship, and since their sophomore season — the school's first at the 6A classification and one in which they won but two games — went 16-6 and qualified for the state playoffs in consecutive years. "This is one of the best groups of guys I've been around," said Liberty head coach Eric Mahlum. "They never quit and they took us to new heights. The hardest thing is knowing that I won't get to practice again with them." Despite that competitive spirit and the work ethic the class of 2019 exhibited over their four years at Liberty High, the defending champion and No. 2-ranked Cavaliers were simply too much for a Falcons team overmatched from the start. Clackamas gashed Liberty on the ground and through the air with revolving junior quarterbacks, Austin Atkenson and Caleb Jordan, and receiver Richard Kennewell, who caught seven balls for 168 yards and two touchdowns. But despite the Cavaliers' prowess with the ball, it was their work in the trenches that decided this game from the opening kick. "Their pass rush was insane," said Liberty quarterback Brad Norman who was running for his life for the bulk of the game. "We didn't prepare as much for the pass rush as we did their overall scheme, but they have some big boys and they're obviously pretty talented too." Coach Mahlum too acknowledged Clackamas' work on both sides of the line, and was quick to take the blame for what appeared to be a fatal flaw in Liberty's attack on the defending champion Cavaliers. "They're a good team and they got after us, and that goes back to me," said the coach. "I didn't do a good enough job preparing our guys. We got outplayed up front and hats off to them, but that's no indication of our guys' effort. They fought their butts off out there." Clackamas took the opening kickoff and used a nice combination of quick passes and runs to go 70 yards in just under four minutes to take an early 7-0 lead. After fumbles ended each team's next possession, the Cavaliers struck again, this time on a Jordan 2-yard run to put the home team ahead 14-0. Jailen Hammer made it 21-0 just a minute-and-a-half into the second quarter, when the senior receiver/defensive back scored from 11 yards out, putting Clackamas ahead 21-0 and putting the packed crowd on notice that this game may be over before it really ever got started — but Liberty thought otherwise. Trailing by three scores, the Falcons' AJ Records blocked a Cavalier punt from their own 30 yard line and junior Cole Smith scooped up the loose ball and scampered for Liberty's first score. After a failed 2-point attempt, the Falcons trailed 21-6 and had new life in a game that had been awfully close to being declared dead. The Cavaliers however responded when — just a minute later — Kennewell hauled-in a 46 yard bomb to put them ahead 28-6. But again Liberty responded when Norman hit Maloney on a slant, which the senior standout took 38 yards for the Falcons' second score, pulling the heavy underdogs to within 28-14 at the break. "Our spirit was good at the half and we talked about how we'd been here before," said Mahlum. "We were going to come out, score and get right back in this. That's the fun part about this team, they don't play with a lot of hope, but rather focus and determination to do well." Sadly, it didn't work out. 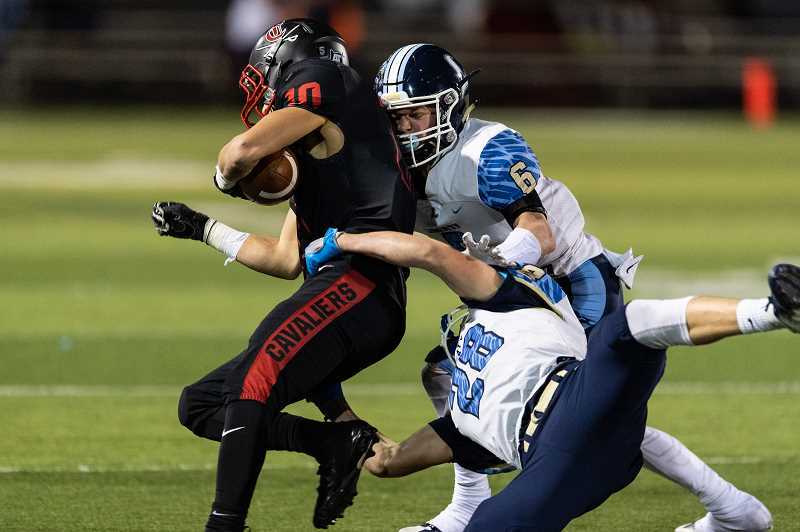 Liberty was forced to punt on their first possession of the second half, and despite a third and long, Clackamas answered the bell when Kennewell caught a quick out, spun out of a Marquis Brown tackle, and raced up the sideline 66 yards to give the Cavs a 35-14 lead. It was more of the same from there on, as Clackamas had their way with a game, but overwhelmed Liberty squad. The home team scored three more times in the third quarter, then tacked-on a field goal midway through the fourth. 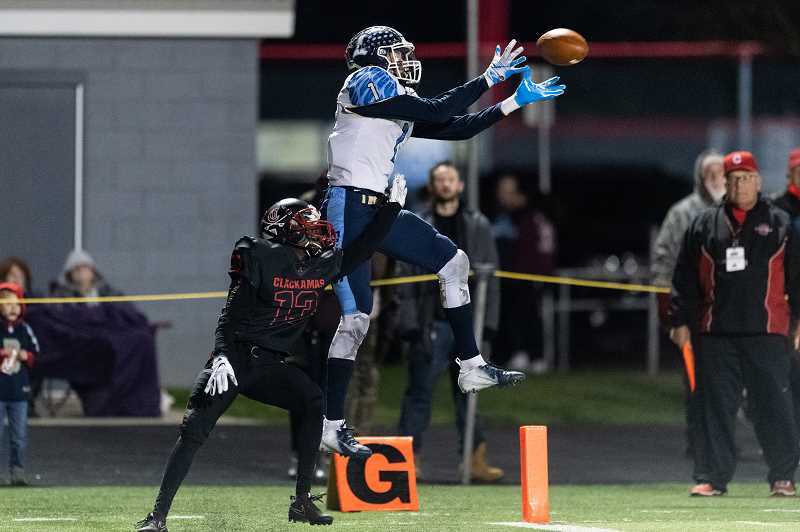 Along the way the Falcons scored their third touchdown, a 10 yard pass to Brown, but on this night it wasn't meant to be, as the Cavaliers advanced to next week's semifinals, while Liberty was left to reflect on what was nothing less than a truly memorable year. "It was an amazing season and it was an honor to play with these guys," said Norman. "I didn't want it to end now, and I honestly didn't think it was going to end." Maloney lamented some mistakes, but was quick to give credit to the opposition. "I think there were some things we failed to do and mistakes we made that we should've corrected, but all the credit goes to them," he said. "They just outplayed us." And while Mahlum and his assistants were quick to heap praise upon Norman, Maloney, and fellow seniors like Nik Reitzug and AJ Records, to name a handful, Maloney was equally complimentary of the coaches for what they had given them in return. "I love these coaches," Maloney said. "Everything they've done for the program and us players, I've got nothing but love and respect for them all."